To contact poets, book talent for your upcoming event or fundraiser, or to book founder Tara Bracco for a speaking engagement, please email info@poeticpeoplepower.com. 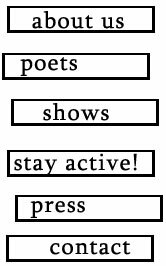 Poets interested in being considered for a future show may email this address for submission guidelines. If you are not a poet, you can still become a part of our community. We seek out partnerships year-round. If you would like to be involved with our marketing efforts or know of a good organization we should work with, please let us know. Want to be stay up to date on events and shows? Join our Facebook page. Is there a topic you would like to see covered at a future show?